While it is tempting to cut back the whole flower garden in the fall, even in colder climates, it can be nice to leave some perennials standing throughout winter months. The seeds of echinacea and rudbeckia will attract and feed the birds and sedum will hold onto snow like frosting. There are also plants that like the protection their foliage provides for their crowns like asclepias (butterfly weed), chrysanthemums, and heuchera (coral bells), which all fare best if cleaned up in the spring. But, there are other plants that will need to be pruned in the fall. No one can pinpoint when the frost and snow will come. Many gardens survive just fine with no attention at all in the fall. This listing can serve as a guideline, but all gardens are unique. What works for one, may not work for another. It never hurts to take some time and put your garden to bed in the fall. Some perennials do not handle rough weather well. They will not remain attractive after frost, and they have recurrent problems with pests and diseases, which will overwinter in their fallen foliage and surface in the spring. These perennial flowers are best cut down in the fall. If they are diseased, throw the foliage away, do not even compost it. There will always be exceptions and time will play a factor. 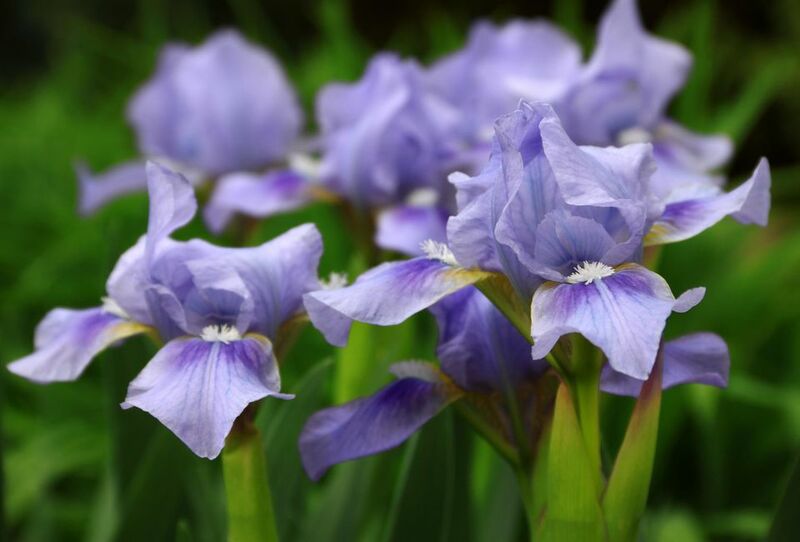 Bearded iris: The tall foliage of bearded iris begins flopping early in the season. By fall, it becomes cover for iris borers and fungal diseases. Cut back after a killing frost and dispose of the foliage, rather than composting it. It grows best in U.S. Department of Agriculture zones 3 through 10. Beebalm (Monarda didyma): Even the most resistant varieties of Monarda can succumb to mildew. When that happens, you will be cutting them back long before fall. Fresh, new growth can be left on until spring. Sometimes selective thinning of the stems is all that is needed and you can leave the remaining seed heads for the birds. It grows best in USDA zones 4 through 9. Blackberry lily (Belamcanda chinensis): Prune to keep the foliage from collapsing and causing the crown to rot and to avoid borers. It grows best in USDA zones 5 through 10. Blanket flower (Gaillardia x grandiflora): Gaillardia is a pretty hardy plant, but cutting back the spent stems seems to improve its hardiness even more by improving its vigor. It grows best in USDA zones 3 through 10. Bronze fennel (Foeniculum vulgare "Purpureum"): Bronze fennel has increased in popularity lately and can be found accenting many gardens. The foliage provides food for swallowtail caterpillars, which can leave the stems completely stripped by fall. If that is the case, it is no longer providing any useful service and can be cut back to the ground. It grows best in USDA zones 5 through 9. Catmint (Nepeta): Nepetas respond well to severe pruning throughout the season. The foliage will be damaged by winter cold and will need to be cut back anyway, so get a head start by pruning in the fall. It grows best in USDA zones 3 through 8. Columbine (Aquilegia): Remove any foliage showing leaf miner damage and remove any debris around the base of the plants. Aquilegia sends out growth early in spring and would likely appreciate not having the old foliage to contend with. It grows best in USDA zones 3 through 9. Corydalis (Corydalis lutea): It is hard to kill corydalis, but if you would rather cut back on its enthusiastic spreading habit and it has not been deadheaded during the summer, cut it back after a killing frost. It grows best in USDA zones 5 through 7. Crocosmia (Crocosmia): The flowers of crocosmia fall off naturally once blooming has finished and the seed heads can offer interest, but the foliage eventually heads downhill and there is nothing to be gained by leaving it up through winter. Daylily (Hemerocallis): Daylilies respond well to shearing and unless you are in an area where they remain somewhat evergreen, fall pruning will save you a messy cleanup in the spring. It grows best in USDA zones 3 through 9. Golden marguerite (Anthemis tinctoria): By late summer, golden marguerite daisies have finished blooming and are nodding off. Pruning to the crown will encourage new basal growth that helps protect and sustain them through the winter. It grows best in USDA zones 3 through 7. Goldenstar (Chrysogonum virginianum): Goldenstar often has problems with powdery mildew. If so, remove and destroy foliage in the fall. It grows best in USDA zones 5 through 8. Ground clematis (Clematis recta): This is a clump-forming clematis that blooms late summer into fall. It produces attractive seed heads, but when hit by a frost, it is as slimy as wet petunias. It blooms on new growth, so do not be afraid to clean it up in the fall. It grows best in USDA zones 3 through 7. Hardy begonia (Begonia grandis): Frost will blacken and collapse the foliage of begonias. If left at the base of the plant, it can cause crown rot. Prevent this by cutting back in the fall. It grows best in USDA zones 6 through 9. Helianthus (H. x laetiflorus, H. salicifolium): These perennial members of the sunflower family usually finish blooming toward the end of summer and go downhill from there. Deadheading does not improve their appearance and the tall stems are guaranteed to break and flop. Cut back to the ground for aesthetics. It grows best in USDA zones 5 through 9. Hollyhock mallow (Malva alcea): Malva alcea is very survivable. Cut these plants down or it will repopulate everywhere. It grows best in USDA zones 4 through 8. Japanese anemone (Anemone x hybrida): Japanese anemones are favorites of certain beetles and are often defoliated by fall. If not, the foliage of Japanese anemones turns black and very unattractive with frost. Unless your Japanese anemones have had a very good year, it is advised to cut them back in fall. It grows best in USDA zones 4 through 8. Ligularia (Ligularia dentata): Ligularia is predominantly grown for its foliage, which turns to a dark mush after frost. Feel free to cut it back. It grows best in USDA zones 4 through 8. Lilyleaf ladybell (Adenophora lilifolia): Lilyleaf ladybells can be cut back after flowering diminishes. Basel foliage will remain fresh until spring. It grows best in USDA zones 4 through 8. Masterwort (Astrantia major): Masterwort is often deadheaded throughout the summer to prolong the bloom time. If conditions are dry, the foliage will begin to yellow and it can be sheared to the crown. Allow the new growth to remain through the winter. If no yellowing occurs, leave the plants for spring cleaning. It grows best in USDA zones 4 through 7. Meadow rue (Thalictrum aquilegiifolium): Performance-wise, it does not really matter when you cut back meadow rue. But since it is done flowering for the season, pruning in the fall is one less thing to do in the spring. However, some varieties will self-seed. If that is desirable, let it go until spring. It grows best in USDA zones 5 through 8. Mountain bluet (Centaurea montana): Mountain bluets tend to become black and unsightly with the first frost and can be cut back in the fall. However, if you sheared them back in late summer and only basal growth is present, you can allow that to remain. It grows best in USDA zones 3 through 8. Painted daisy (Tanacetum coccineum): Painted daisies can easily rot in wet soil. Prune in the fall to prevent the foliage from flopping over onto itself and acting as a mulch. It grows best in USDA zones 3 through 7. Penstemon (Penstemon barbatus): Penstemon does not like wet feet and should be planted a little higher in the ground than most plants. The foliage usually declines toward the end of summer and can be trimmed back, inducing new basal growth that is sufficient to mulch the plants through winter. Allowing the older, tall growth to flop would hold too much moisture around the crown. It grows best in USDA zones 5 through 9. Peony (Paeonia): Peonies need a period of cold to set buds for the following season. That, coupled with the fact that their foliage is extremely prone to mildew, is reason enough to remove the foliage in the fall. Infected foliage can be removed and disposed of in late summer. Healthy foliage will turn golden in fall and can be removed once it has turned to mush after the first frost. It grows best in USDA zones 3 through 8. Perennial sunflower (Helianthus): By this time, helianthus foliage is not a standout and by the time the flowers have faded, it is also time to cut the plants down. It grows best in USDA zones 4 through 9. Phlox (Phlox paniculata): Phlox is prone toward powdery mildew. Even the resistant varieties can become infected in bad weather. If so, prune and destroy all foliage and stems in the fall. It grows best in USDA zones 4 through 8. Plume poppy (Macleaya cordata): Plume poppies are nearly impossible to kill. Cut these back before they go to seed or you will have plume poppies everywhere. It grows best in USDA zones 3 through 8. Salvia (Salvia nemorosa): Perennial salvia benefits from several prunings during the growing season. In fall when blooming slows, cut the whole plant back to the new basal growth. It grows best in USDA zones 3 through 8. Siberian bugloss (Brunnera macrophylla): Although it is not necessary since brunnera is an early riser in the spring and its foliage will turn black and unattractive with the first frost, fall clean-up is preferable. It grows best in USDA zones 3 through 8. Sneezeweed (Helenium autumnale): Helenium usually does not finish blooming until mid-fall, but by that time it is often covered with mildew. The foliage can be cut back and removed before winter. It grows best in USDA zones 3 through 8. Solomon’s seal (Polygonatum odoratum): Although listed here, Solomon’s seal pretty much disappears on its own after a frost or two. Certainly, the leaves will drop. If the stems remain, it can be pruned back to the ground. It grows best in USDA zones 3 through 9. Veronica or Spike Speedwell (Veronica spicata): As flowering ceases, the plants can be sheared to the ground. It will only turn black and ugly if left until spring. It grows best in USDA zones 3 through 8. Wild or false indigo (Baptisia australis): Baptisia is one of those plants that splits in the middle if it is not sheared back after pruning; however, many gardeners like the seed pods and simply stake the plants. Come frost, the foliage turns black and even staking is not going to help its appearance. Cut back for aesthetics. It grows best in USDA zones 3 through 9. Yarrow (Achillea): Achillea does not like to sit in cold, wet soil. By fall, most of its blooms are spent and the foliage is flopping and possibly diseased. Cut back in early fall and new basil growth will fill in before frost. It grows best in USDA zones 4 through 8.